The long-awaited film arrives Friday with a lot more than box office hopes riding on T'Challa's broad shoulders. Wakanda, the fictional home of Marvel's "Black Panther," rests on the continent that real-life President Trump reportedly derided in coarse terms last month. Perhaps the nation’s supply of vibranium, the potent metal used to help fashion Captain America's shield, would draw more than just knee-jerk scorn from profiteers and other exploiters. But that would be missing the point: In all countries, rich or poor, the greatest resource is the people. The leading export of technological powerhouse Wakanda – its king and protector, T'Challa, aka the Black Panther – lands in theaters Friday, a proud son of Africa poised to rise as a hero beyond the big screen. The film arrives amid the biggest hype for a superhero movie since DC's "Wonder Woman" lassoed last year's summer box office. In both cases, high expectations – and hopes – ride on far more than past comic book popularity. Wonder Woman's first major solo movie, 76 years after her debut in All Star Comics No. 8, drew cheers from girls and women at a time when many feel under attack in Washington and Hollywood. It’s been more than five decades since Stan Lee and Jack Kirby introduced the Black Panther via a Fantastic Four adventure in the turbulent 1960s. But his cinematic star turn is no less meaningful to movie audiences long starved for a powerful, black male superhero. While comparisons to "Wonder Woman" are apt, the advent of "Black Panther" also recalls the excitement that greeted Spike Lee's "Malcolm X" in 1992. Denzel Washington, at age 38, solidified his place as one of our great actors with his nuanced, searing performance. 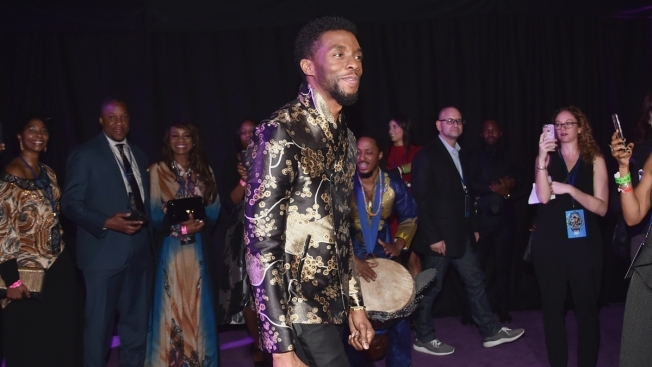 Chadwick Boseman tackles Black Panther at age 41 after giving vibrant movie life to groundbreakers likes Jackie Robinson, James Brown and Thurgood Marshall. In "Black Panther," he leads a stellar cast that includes Oscar-winner Lupita Nyong'o and Michael B. Jordan, directed for Disney by Ryan Coogler ("Fruitvale Station," "Creed"). "Black Panther" already is racking up strong reviews, amid predictions for a record February opening. But more significantly, the film is being touted as a cultural benchmark, even before the public flocks to theaters. That's a lot to put on the latest in a long line of comic book-derived popcorn flicks. But Black Panther beats with a heart as strong as vibranium, and powered by the many people he represents. Far more than the potential for box office glory weighs on his broad shoulders.